A standard phrase of Ron White, one of my favorite comedians is “You can’t fix stupid.” Sometimes I wonder if he came up with that phrase because of Democratic National Committee Chair, Debbie Wasserman-Schultz. She may not be the dumbest person in congress, although she does compete with Barbara Boxer and Sheila Jackson Lee for the title, but may very well be the biggest simpleton ever to hold a leadership position in either major political party. The latest demonstration of cerebral feebleness by the DNC Chair occurred last night during the MSNBC show of racial arsonist, “Reverend” Al Sharpton. Her interview with the professional bigot included many new Wasserman-Schultz classics. When discussing the voter ID laws cropping up across the nation to prevent voter fraud, Wasserman Schultz commented “you’re more likely to be hit by lightning than be a victim” of fraud. 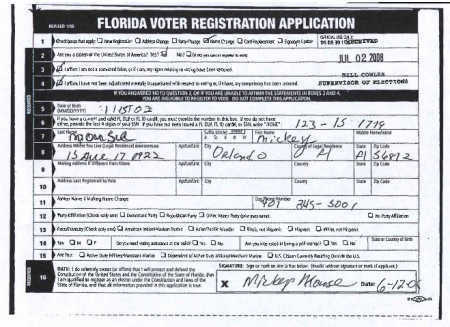 I suppose the progressive from Florida forgot about the systematic voter registration fraud waged by ACORN across the country (including her own state). Perhaps the worst thing the DNC Chair said was at a level of incompetence rarely seen even for someone like Ms Wasserman-Schultz. With a straight face she said, “We’ve really begun to turn the economy around.” Not a smirk or snicker, she really seemed to believe what she was saying. See what I mean, it is impossible for someone with a normal supply of cranial capacity to decipher that information as turning the economy around. If you would like to see the evidence for yourself a video of Debbie Wasserman-Schultz’s interview is embedded below (if you cannot see video please click here).